Wildlife artist Joe Hautman of Plymouth, Minn., today won the 2007 Federal Duck Stamp Art Contest – the oldest and most prestigious wildlife art competition in America – with his depiction of a pair of pintail ducks. Department of the Interior Secretary Dirk Kempthorne announced the winner in front of a crowd of 300 people at the contest, held at BIG Arts in Sanibel, Fla.
Hautman’s painting – chosen from among 247 entries from artists across the country – will be featured on the 2008-2009 Federal Duck Stamp which will go on sale in late June 2008. Federal Duck Stamp sales raise about $25 million each year to fund wetland habitat acquisition for the National Wildlife Refuge System. The annual Federal Duck Stamp Contest is the only federally-sponsored juried art competition, and is run by the U.S. Fish and Wildlife Service. This year’s contest crowns the winner of the 75th duck stamp since the program’s inception in 1934. Before 1949, a commission selected the design. The competition was surrounded by a week of public events at J.N. “Ding” Darling National Wildlife Refuge and BIG Arts celebrating the life of artist, conservationist and creator of the Duck Stamp, J.N. “Ding” Darling. Born in 1876 in Michigan, Darling was a two-time Pulitzer Prize winner for his conservation-themed cartoons. He also served as Chief of the Bureau of Biological Survey, the forerunner of the U.S. Fish and Wildlife Service, from 1934-1935. Darling’s conservation legacy remains the foundation for the broad-based support and strategic vision of North America’s successful waterfowl management efforts. Joe Hautman won the Federal Duck Stamp contest in 1992 and 2002. He has also won multiple state Duck Stamp contests. His brothers, Bob and Jim, are also multiple Federal Duck Stamp Contest winners. Hautman attended the Federal Duck Stamp contest this year with his family. The audience gave him a standing ovation when his art was chosen as the winning piece. 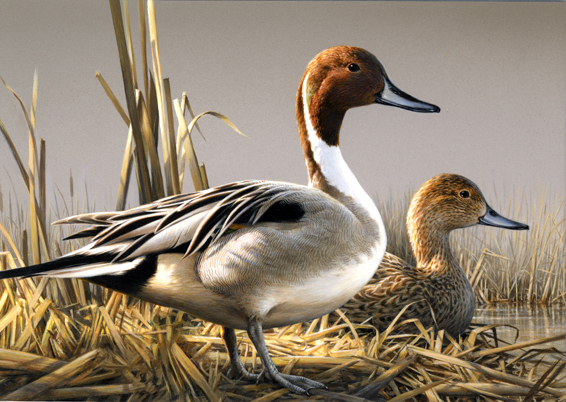 Hautman’s winning art depicts two pintails—a male and female—nestled gracefully atop reeds in a marsh. Plates Issued: Offset/microprinting, FWS Colors: Black, Cyan, Magenta,Yellow. Artist: Joseph Hautman, Plymouth, MN Modeler: Joseph Sheeran Printer: Ashton Potter (USA) Ltd. (APU). First Day of Sale: June 27, 2008, Hanover, Maryland Issue: Seventy-fifth Duck Stamp ($15.00 commemorative stamp), Pressure-Sensitive Adhesive (PSA) Item 33800. Quantity Sold: N/A. First Article/Design and Production Sheets: WAG or PSA. Back - Barcodes "333800" in four positions .Verso-text. ordering information.